Norway’s former minister of both the environment and foreign aid, Erik Solheim, is facing a severe scolding from auditors at the United Nations over how he’s carrying out his current duties as head of the UN Environment Programme (UNEP). They’re sharply criticizing Solheim’s alleged overspending on near constant travel and lack of respect for UN regulations and funds, and even question his commitment to the environment and reversing climate change. Solheim was on the cover of Norway’s biggest newspaper Aftenposten on Thursday, for all the wrong reasons. It reported how UN auditors are accusing the 63-year-old Solheim of having too little consideration for the environment, UN regulations and his budget as head of UNEP. They’re also demanding, in a draft report sent to Solheim and others at the UNEP, refunds of some of the UN funds spent while traveling around the world since his appointment as leader of the UN’s environmental effort in May 2016. Aftenposten reported that during Solheim’s first 660 days as the UN’s climate boss, he spent 529 of them out traveling at a cost of NOK 4.1 million (around USD 500,000). The auditors from the UN’s Office of Internal Oversight Services (OIOS) claim that many of his frequent trips from UNEP headquarters in Nairobi, Kenya lack proper documentation that they actually were work-related. On two occasions, Solheim allegedly changed his tickets to more expensive ones. The UN auditors seem mostly critical of how travel expenses have been authorized or justified, especially when Solheim’s extensive air travel contributes to carbon emissions. UNEP employees reportedly are not encouraged to find alternative means of travel or ways to reduce their own carbon footprints. 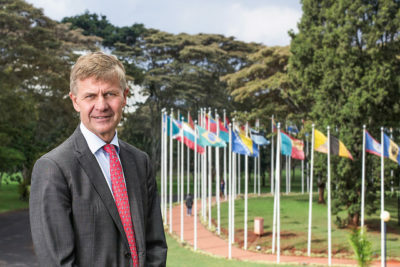 Solheim, a former leader of Norway’s environmentally conscious Socialist Left party (SV), has reportedly spent around 80 percent of his time out traveling and is rarely in his office at UNEP headquarters in Nairobi. That has also, according to Aftenposten, been a subject of frustration and criticism within the office in Nairobi and in several countries’ embassies in Nairobi. Solheim’s lengthy absences from the UNEP offices have also reportedly been a matter of concern within Norway’s own foreign ministry, which oversees the country’s financial contributions to UNEP of around NOK 140 million a year. UNEP relies on funding from UN member countries around the world. Solheim also apparently gave permission for two other leaders within UNEP to work from Paris, even though they were formally stationed in Nairobi. One of them even received extra pay for an alleged security risk of being based in Nairobi, even though she worked in Paris. OIOS views that as a clear violation of regulations. According to the draft report obtained by Aftenposten, Solheim has also spent 90 days in Oslo and Paris, where he has lived, with only 14 of them registered as days off or holiday. The other 76 were unaccounted for. One of the UN internal auditors wrote that the reason for some of the trips was simply listed as “bilateral meetings,” even though the trips occurred during weekends and the Christmas holidays. In one case, Solheim was reported to have taken an eight-hour flight from Washington DC for a weekend in Paris before taking another flight from Paris to New York. Auditors claim travel has been poorly planned or not properly approved, at a time when the UNEP’s travel budget has nearly doubled since 2014. UNEP staff registered a total of 27,458 trips between January 2016 and March 2018, at a cost of the equivalent of NOK 486 million, according to Aftenposten’s information. Solheim, currently in San Francisco to take part in an international climate summit organized by the State of California, stressed that the report is just a draft to which he has responded. He objected to what he calls “many errors” in the auditors’ report. He wouldn’t comment on what he thinks is wrong with it, but said that a new report will be issued based on “our answers.” Officials at OIOS also refused comment on its draft report at this point. Aftenposten reported, however, that it’s seldom any changes are made in the facts or recommendations made in an OIOS draft audit. It also reported that Solheim and others within the UN system have expressed frustration over what they view as its excessive bureaucracy and regulations that are far too rigid. OIOS reportedly commented on that, too, writing that UNEP’s leadership was willing to work around regulations that they viewed as either too bureaucratic or political.